Members of Rockland County’s group of adults who were hidden as children during the Holocaust. 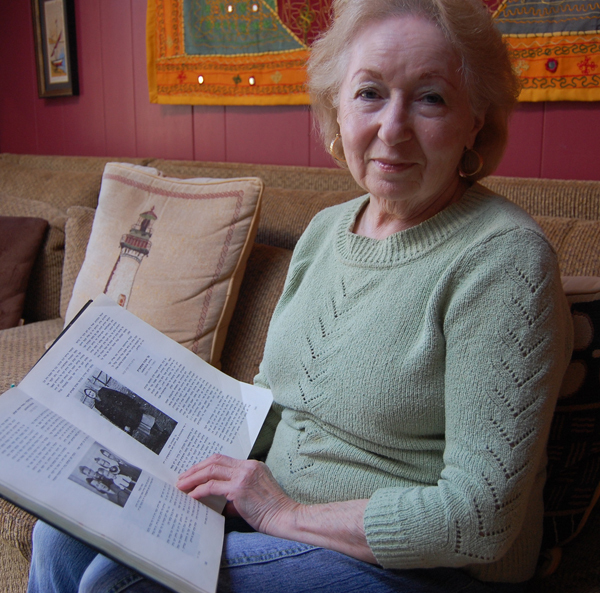 It was 1990, and New City resident Lola Kaufman was reading an article in New York Magazine that caught her breath. Organizers of a conference were looking for “hidden children,” those youngest Holocaust survivors who had spent the war years sheltered and ultimately saved by non-Jews. Kaufman, who is from Czortkow, a shtetl in Glacia that was part of Ukraine when the war broke out in 1939, had never really spoken about her experiences in hiding during the war. But she approached a friend from Poland about it and the two decided they would go to the Marriott in Manhattan together and be part of this first international gathering over the Memorial Day weekend in 1991. What she found was startling. Organizers were expecting maybe a few hundred people. Instead 1,600 former hidden children showed up. They came from all over the world — France, Germany, South America, Australia, Israel, England, the United States, Canada. All of them had childhood experiences that resonated with Kaufman’s. The days of their lives that were supposed to be innocent and care free, were instead spent hungry and cold, terrified and confused. Their childhoods unfolded in dark cellars and attics, in convents and in monasteries. Separated from their mothers and fathers and siblings, they changed their names and identities, sometimes multiple times. Many never saw their families again. The conference was eye-opening, not only because it drew so many of these former hidden children, but also because of what happened afterward. Those who had been hidden found they connected with one another for the first time on a scale that no one had imagined. In the wake of the conference, however, they realized there were others around them with similar narratives and experiences. So many went home and formed their own groups, with regular meetings. Kaufman and Gorewitz were no different. After the conference, they became a part of a Rockland County group for former hidden children. At its height, it numbered about 25 members who met monthly. But as they have aged, even these youngest Shoah survivors see their number dwindling. Today they meet every other month, and they number about 15, Kaufman says. They continue to meet in different homes, and they no longer really have to speak of the terrible past, or politics, which has been divisive. After two decades of meetings, they do it simply because they are friends. Lola Kaufman was hidden in a hole in a cellar during World War II. Kaufman was nine years old. All of her family was gone, except for an uncle who survived because he’d joined the Soviet army as they retreated. She came with him and his family to the United States in 1949, after living in a Displaced Persons camp. There she dreamed of going to Israel, but her uncle insisted she come to America. They observed holidays, but were not terribly religious, though her town, Czortkow, was home to a Hasidic dynasty. It had been Polish when she was born, but in 1939, and when Germany invaded that country, their Soviet allies took over. In 1941, when the Nazis invaded the Soviet Union, they entered her town. She doesn’t have too many memories of her hometown, though she does have a few photos, and the town square, across the street from her home, is seared in her mind. As she sat at the window looking out one day, she remembers a German soldier yelling at a man. The man had a beard, so she thinks he must have been a Jews. The man put up his hands but did not stop and the soldier shot him. The Jews were put in a ghetto. There her father died of an illness, she’s not sure what, though suspects leukemia. Her mother worked as a seamstress for the Gestapo. And although she had the right papers to be out of the ghetto, one day an S.S. officer stopped her mother and two other women. He took them to a courtyard, lined them up and shot them. It was her grandmother who found a way to sneak her out of the ghetto. Eventually she ended up at a farm, where Anna Aksenczuk, took her in. There, she hid in a hole beneath a vegetable cellar along with a Jewish woman named Rose, her little girl, who was about two years younger than Kaufman and the woman’s son. Although many of the people around her in America were survivors, they didn’t speak of their experiences, she says. It wasn’t until an author, Jane Marks, interviewed her that she began to say anything. “Oh no, I didn’t talk. She gave me her card but I guess she didn’t think I’d call. She called me,” says Kaufman, who had to be coaxed into telling her story. Marks wrote “The Hidden Children,” published by Ballantine Books, in which Kaufman’s story appears along with those of other former hidden children. Even though former hidden children, like other survivors, didn’t initially divulge their pasts, they somehow found their own kind. It was like former generations of Jews who found landsmanschaften when they came to this country, the immigrant societies that were formed and named for members’ birthplace, according to Carol King, a social worker at Rockland Jewish Family Service. King runs Café Europa, a program of the Holocaust Museum and Study Center in Spring Valley. The program, which serves local Holocaust survivors, is “about creating a space for them to be together,” says King. For the hidden children, their experiences often vary based on how old they were when they had them. Some have no memories of their parents, says King, while others have preverbal ones and still others have those of a toddler, a young child or an adolescent. They also are both survivors of the Holocaust themselves and are “2G,” or “second generation survivors,” according to King. Although Shoah survivors eventually began telling their stories individually, a mass telling began to happen after Steven Spielberg made the film,” Schindler’s List” in 1993. Following that, Spielberg put $12 million into videotaping the testimony of 52,000 Holocaust survivors living in 56 different countries. Locally, the hidden children work with the Spring Valley museum, telling their stories in area schools. It’s an important aspect of the Museum’s work, according to Lisa Stenchever, the museum’s educational director. It isn’t just young students who feel that power, either. Joe Allen, a senior vice president at Active International in Pearl River, became friends with Cecile Kaufer, when he was working in an office in Chestnut Ridge in the late 1990s. As their friendship developed, snippets of Kaufer’s past in war-torn Poland and then Paris slipped out. Anne Weissmann is thankful her mother made her take piano lessons as a child. Born in Belgium, Weissman was nine years old when the war began. And it was her piano teacher and her teacher’s mother who first hid her and her parents. But the piano teacher harbored them in a spare room upstairs. For a year and a half, Weissmann and her parents could not leave. During the day they stayed in bed, not able to walk on the floor or talk for fear that piano students below would hear. “We were lucky though,” says Weissmann, because the piano teacher’s mother owned and ran the grocery store on the ground floor. Since the Weissmanns didn’t have food stamps they had to buy it on the black-market. They couldn’t walk on the streets because they were known in the neighborhood and someone might spot them. One night, the piano teacher’s mother said that someone had found out she was hiding Jews and they were all in danger. They would have to leave immediately. So while Weissmann and her mother took their new identities, as non-Jewish Belgians, to look for a new room to rent, her father stayed with the piano teacher. An elderly Belgian woman agreed to rent a room to Weissmann and her mother. It happened to be Christmas break so nobody questioned that Weissmann wasn’t in school. Once Christmas break was over, Weissmann’s mother again went to the Underground to find a new place for Weissmann. They set up with a priest for her to be taken to a convent the next morning. “I wasn’t allowed to bring anything besides for the clothing I was wearing that day. I couldn’t say goodbye to my mother. I was brought to a bus stop and there a man motioned for me to follow him and I got on the bus,” Weissmann said. That was the last time she saw her mother. After the liberation, her father, who had been kept safe at the piano teacher’s home, came for her. After studying in a school in Europe for awhile, an Uncle from New York found out that Weissmann had survived and asked her to come to America. A few days later her father decided they would move to Antwerp, Belgium. They lived a comfortable life, and she dreamed of becoming a pioneer in Palestine. The misery of Romania was behind them. Gorewitz, her older sister, her younger brother, and her mother were all saved by becoming part of the Underground, which was run by the Red Cross. They dyed Gorewitz’s hair blonde and because she came to Belgium as a young child she spoke French and Flemish without a foreign accent. “You couldn’t live if you didn’t have a hiding place,” she said. There were many non-Jewish families that helped them. They moved constantly in order to stay one step ahead. “And you couldn’t live if you didn’t have the food stamps,” she said. One of her jobs as part of the Underground was to find ways to get these food cards once a month so that she and the others could eat. Another job she had was to take young Jewish children left at shelters to the churches and orphanages where they would be taken care of by the nuns. She managed to save about 18-20 children and after the war was recognized by the king of Belgium. After the war, Gorewitz and her sister both married Jewish American soldiers and traveled to America with their new husbands. Gorewitz was 19 when she moved to the Bronx with her husband, Rubin. “We were on a boat with 600 G.I. brides, it was possibly the best comedy display ever,” she laughed. Gorewitz has spoken to many schools, at many programs, and has been interviewed countless times. “I’ve told my story a million times and it is never easy because you’re dealing with the reality that this is what your life was,” she said. Edith Rosen, who lives in New City, had three identities, escaped from an internment camp with her family, walked to Paris from the south of France and lived through two convents to survive the war. It started with news from family in Poland that worried her father. “He had a premonition. He said if they were killing Jews in Poland, they will kill us all,” says Rosen. In 1940, they left Paris for the south of France, where they lived in “heaven” tending a farm, according to Rosen, who was then Ida Szajnfeld and nine and a half. But they were eventually put in a camp. They escaped with the help of a French policeman, and walked three weeks to Paris. An aunt had taken over their apartment and they went into hiding, just outside of Brussels, Belgium. When the Nazis arrived there, they deported the Jewish children. A “tall, slim woman with a chignon,” who ran the sight agency, Heart of the Blind, helped Rosen’s parents place her with a blind woman in Brussels. But Rosen was petrified, and took the subway back home. In June of 1943, she was placed in an orphanage run by nuns. She became Gabrielle Sterkx and was told to say her mother was dead. She withdrew into her studies. “I was a different person, my mind changed from having a happy life, laughing and playing into a student of religion and French literature,” she says. The mother superior terrified her, and she learned her catechism and that Jesus was crucified by the Jews. She remained there a year and a half, when she was reunited with her family, but only for a short while. Then she was sent to another convent, a boarding school. Her mother walked seven miles to get her and she stayed with her family. When the war ended, her life was in flux. She’d missed three years of school and was behind. Her brother, who had hidden with a priest, only missed a year and went to university. She wanted to go to Israel, but the young country was under constant threat, and her parents didn’t want her returning to a war zone. Instead she returned to the U.S. where she met her husband. “I did not want to discuss my past. I wanted to forget it. Every once in awhile people would ask me, or say ‘Forget about it, it’s over,’ or ‘You’re lucky, you were not in a camp.’ What did they know? That first conference for hidden children changed the way they thought about their experiences, according to Carla Lessing, one of the organizing volunteers who had been galvanized by a showing of Myriam Abramowicz film, “Comme Si C’etait Hier,” (“As If It Were Yesterday”) about rescuers. It was easy for the former hidden children not to talk. They’d been instructed to be silent: Don’t divulge your real name. Don’t talk about your family or your history. Don’t tell them you are Jewish. Don’t forget to say the shema. “We were quiet, but here it was 40 years later and the child survivors were all grown up and said, ‘This is ridiculous. We were Holocaust survivors,’” Lessing says. The conference organizers were overwhelmed by more than 3,000 calls leading up to it. They asked the Anti-Defamation League for help, because its director, Abraham Foxman, was himself a former hidden child. The conference was a success and groups like the Rockland one flourished in its wake. They have provided support and educational outreach for many over the years. The most moving moment during the weekend, according to Lessing was when organizers brought 25 rescuers onto the stage. The standing ovation they were given was thundering. Their reasons for doing what seems audaciously courageous today, were simple. It was the right thing to do. Kaufman is in touch with the youngest son of the family who saved her life. She sends him money. The parents are listed as righteous gentiles at Yad Vashem in Israel. One time, after she spoke to a school group, a man asked her if the tables were turned, would she take someone in?